Adren Dobbs' bike crashed into the trees. 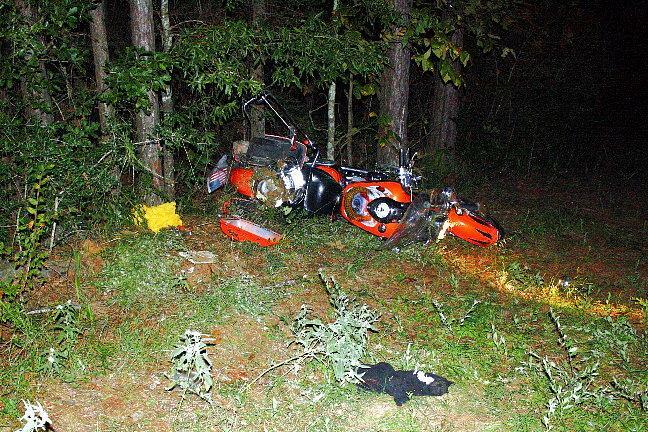 Motorcycle Accident, Life Flight Summoned, SCENIC LOOP, October 16, 2009 - At approximately 10 pm on October 15, 2009, an Orange 1998 Yamaha KVZ motorcycle driven by Adren Warren Dobbs, 56, of Livingston was south-bound on FM-3277 less than a mile from FM-2457 when he came into a curve too fast. According to witnesses, Dobbs lost control of his motorcycle and his bike became airborne. 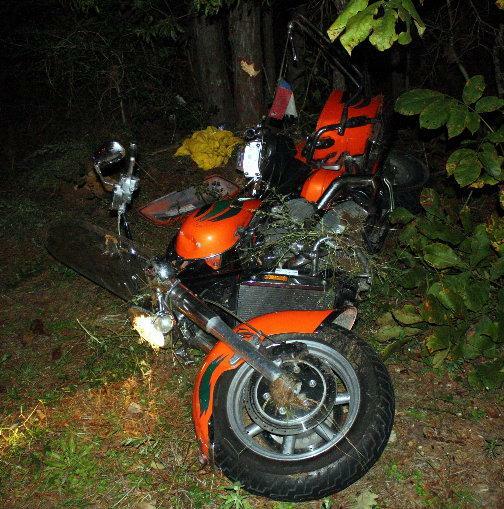 Dobbs' motorcycle left the road to the left, and slammed into the tree. 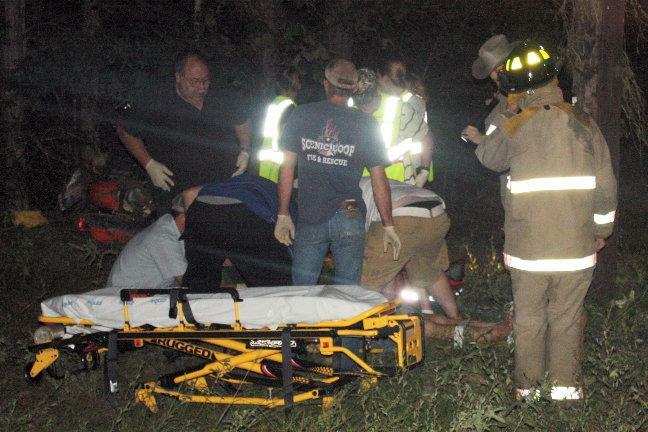 Americare Ambulance was dispatched to the scene along with Polk County Sheriff's Deputies Jamie Buie and Darren Crow. Also dispatched to the scene were Troopers Ramey Bass, Nita Bowen and Sam Lattner. 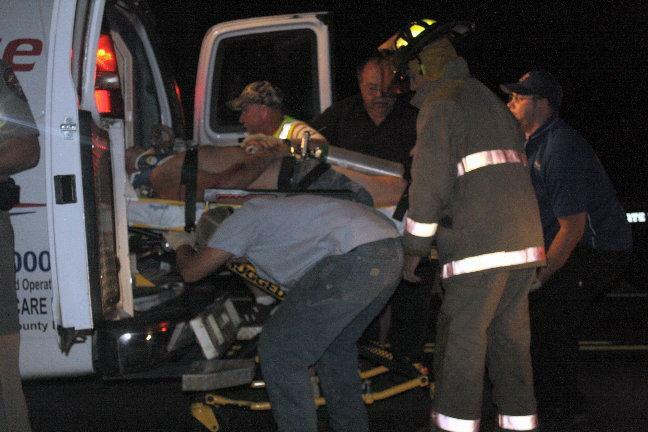 The Scenic Loop Volunteer Fire Department assisted in rescuing Dobbs from his crashed bike. Traffic on FM-3277 was partially blocked during investigation and cleanup. Dobbs was not wearing a helmet and sustained serious injuries to his head and other internal injuries. Dobbs was treated on the scene by personnel from Americare and a short time later he was turned over to Life Flight which landed on FM-2457. Dobbs was transported to Hermann Hospital in Houston. Dobbs will be issued a citation for unsafe speed. Dobbs did have insurance and his bike was recovered by Harwood Wrecker Service and it will be stored at Harwood in Livingston. The scene was cleared by 11:30 pm. 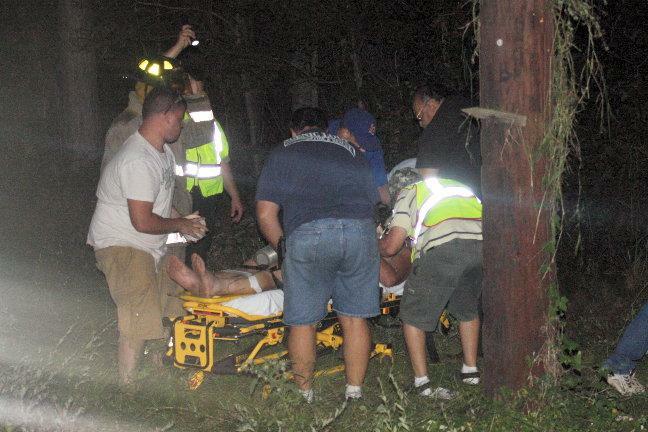 Emergency personnel work on Adren Warren Dobbs of Livingston. 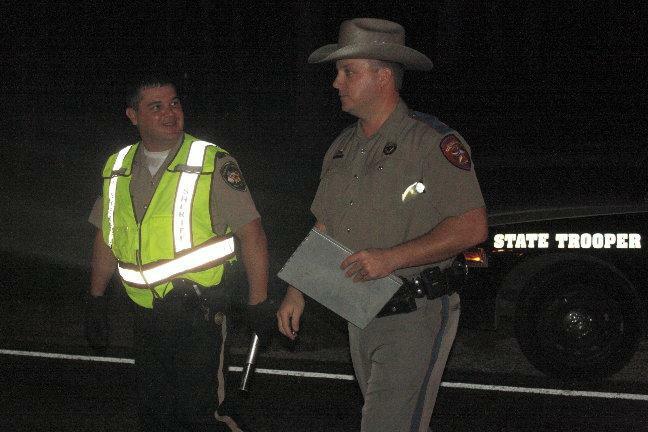 Deputy Jamie Buie (left) and DPS Trooper Sam Lattner. 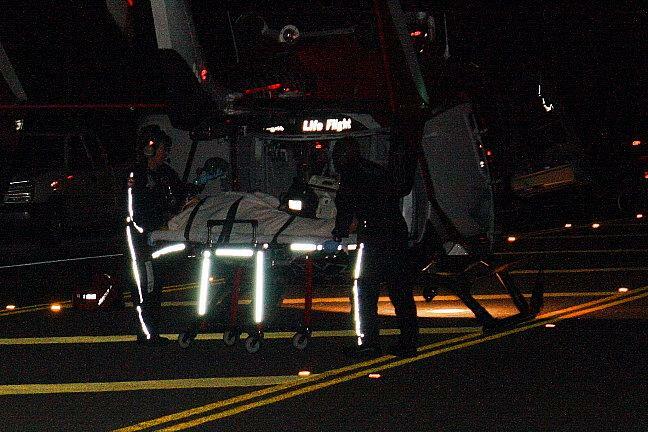 Dobbs is loaded onto a waiting Life Flight Helicopter and flown to Hermann Hospital in Houston.